Yeast Extract Market size was above USD 1.1 billion in 2015 and gains expected at over 5.5%. Strong application scope in food & beverages, animal feed and pharmaceuticals industry should drive yeast extract market size. They are categorized under natural food flavouring ingredient which is suitable for incorporation in canned, processed & frozen food products, dairy products, and dietary supplements. They are rich source of proteins, minerals, B complex vitamins, lipids and nucleotides. Europe food & beverage industry was valued at USD 1.20 billion in 2015. Consumer adoption towards international cuisines and culinary trends along with rising demand for health and wellness food products should drive market size. These products are used in flavouring food & beverages products and are also used for salt reduction and replacement for synthetic additives. Global MSG consumption accounted for over to 3 million tons in 2015. Glutamate is natural component present in various tomatoes, walnuts, mushrooms and peas. Yeast extract contains around 5 % glutamate which is safe for human consumption whereas MSG contains around 90% glutamate which may lead to MSG allergies causing headaches, nausea hypertension and weakness. Rising awareness regarding use of natural ingredient with flavour of its own accompanied with prevailing MSG allergies should drive yeast extract market. Global animal feed additives market size may exceed USD 25 billion by 2024 with gains at over 4%. These products form significant part of animal feed additives due to high nutritive value which helps in meeting nutritional standards required for metabolic functioning and immune system. These products possess meaty colour and taste which results in high palatability, thereby influencing market size in animal feed applications. Brewer’s, baker’s yeast, saccharomyces cerevisiae and molasses are key raw materials used in manufacturing. Molasses are highly preferred fermentation and growth media for production. Fluctuating raw material costs may create supply deficit and challenge industry profitability thereby affect yeast extract market price trend. Autolyzed yeast market should witness significant gains and be valued at over USD 1.25 billion by 2024. Increasing application scope in animal feed and food & beverage owing to its abundant natural nucleoside content along with meaty flavour should drive product demand. They are very useful in livestock digestive system development and nutrition thereby promoting product demand for animal feed additive industry for sugar reduction and enhancing flavour. Hydrolysed yeast market may witness steady gains due to strong application outlook in processed food, animal feed and cosmetic industry. Hydrolysed yeast is a prominent flavour enhancing ingredient in processed food. Rise in consumption of convenience food owing to changing dietary habits along with positive outlook towards catering and hotel industry mainly in India and China should fuel product demand. Technological innovations for promoting new products developments has developed demand in cosmetic and pharmaceutical industry. Hydrolysed yeast extract is used in shampoos, conditioners and skin moisturizers due to conditioning properties. Baker’s yeast market size may witness gains at over 4.5%. They are widely used in fermented food and bakery products for efficient rise and good texture. Rise in breadsticks, pizza, doughnuts, rolls and cakes consumption along with increasing working women demographics mainly in China and India should drive yeast extract market size. Brewer’s yeast market should witness significant growth. It is extensively used in various end-use industries which includes dietary supplements, alcoholic beverage fermentation, pharmaceutical and animal feed. Brewer’s yeast is also known as medicinal yeast and has strong application scope in pharmaceutical industry for swine, respiratory tract, diabetes and skin treatment. Investments in R&D spending along with positive outlook towards brewer’s yeast benefits in animal feed and dietary supplements should favour product demand. Powder yeast extract market size may surpass USD 1.5 billion by 2024. It is extensively used in cheese, dairy cultures and processed food. These extracts are used in vegan cheese production and has strong application in processed foods such as sauces, dips and dry snack as low cost natural flavoring agent. Rising demand for milk & milk products along with clean label status is likely to drive product demand. Paste market size should witness steady growth due to prominent application in animal feed industry. It is used to stimulate growth and improve digestion and immune system in young livestock. Increasing consciousness among livestock farmers regarding animal nutrition should fuel product demand. Yeast extract market size from food & beverage application should witness significant growth at over 4.5%. It is used as flavor enhancer, seasoning & dressing ingredient along with salt reduction properties replacing MSG. Investments in research by various manufacturers for new products developments along with increasing packaged food production should favor product demand. They are widely used in processed food, soups, sauces & savory mixes, dairy and bakery products in food and beverage applications. 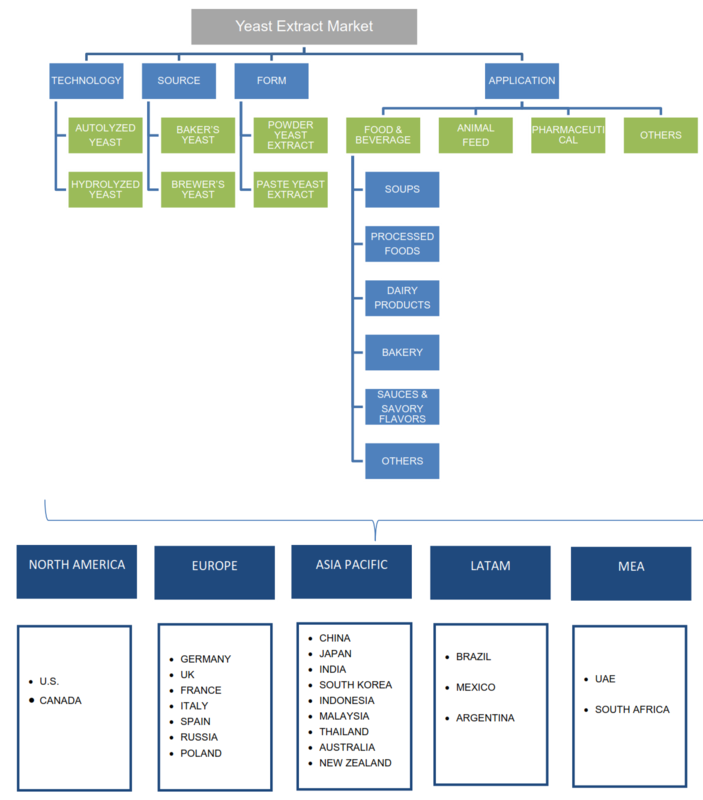 Soups market share for food & beverage application should register over USD 185 million. Rise in consumer health consciousness accompanied with shifting preference towards health and wellness products due to prevailing health concerns such as obesity and diabetes is should drive industry growth. 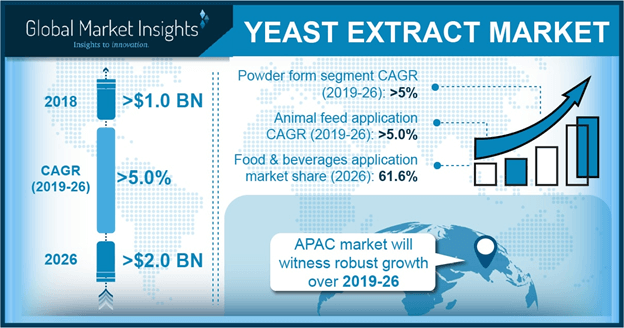 Yeast extracts market size from animal feed application should witness 6% gains. Hydrolyzed yeast and brewer’s yeast are mainly used in animal feed products. Increasing application outlook in pet food and aqua nutrition products should drive industry growth. Yeast extract industry size for pharmaceuticals application should witness significant gains at over 4% by 2024. These extracts are natural source of contains minerals, amino acids, flavors and proteins. Growing demand for dietary and nutritional supplements due to increasing geriatric population mainly in India and China along with consumer inclination towards organic ingredients should stimulate industry growth. Europe yeast extract market size should witness gains at over 4%. Favorable regulatory landscape regarding clean label along with organizations such as EURASYP, promoting yeast products for consumers, manufacturers and retailers should drive regional industry growth. Germany market size should witness significant gains. Increasing high quality organic food products demand should drive regional growth. Many companies are investing in food & beverage industry along with supporting regulatory norms should drive product demand. China yeast extract industry size may register close to 6% gains due to strong application scope in processed food. Growing processed food consumption along with rising economic standards flourishing hotel and culinary industry should drive regional growth. Brazil market size may register over 5% gains by 2024. Positive indicator towards consuming healthy low salt and sugar organic food products along with increasing convenience food demand should drive regional industry growth. Global yeast extract market share is moderately consolidated with prominent market players operating in this industry include Angle Yeast, AB Mauri, Lallemand, Lessafre, DSM, Kerry Group and Ohly. Other players operating in this market include Oriental yeast, Titan Biotech, Bioorigin, Alltech, Halcyon Proteins, Synergy Flavours and Biospringer. Companies are focusing on strategic alliances and technological developments to expand products portfolio. Most of the extract manufacturers such as DSM are developing new products with low CO2 emission thereby expanding existing product range. Yeast extract is a natural ingredient consist of carbohydrates, amino acids, minerals, vitamins and high quality proteins. These extracts enhance flavour, taste and imparts savoury notes to the food balancing salt content making it suitable for food & beverages and bakery & brews products. It contains nitrogen and essential nutrients which promotes microorganism’s growth further beneficial for pharmaceutical and diary cultures. Change in consumer lifestyle along with rise in economic standards may contribute towards frozen and convenience food sector. Easy of availability due to manufacturers, retailers, online shopping trends should have positive effects on product demand.